"[Ian Purkayastha] has a true, deep expertise in everything he sells--caviar, truffles, fish. He knows the stories that we need to sell the stuff tableside . . . he can disrupt the entire luxury foods market." Ian Purkayastha is New York City's leading truffle importer and boasts a devoted clientele of top chefs nationwide, including Jean-Georges Vongerichten, David Chang, Sean Brock, and David Bouley. 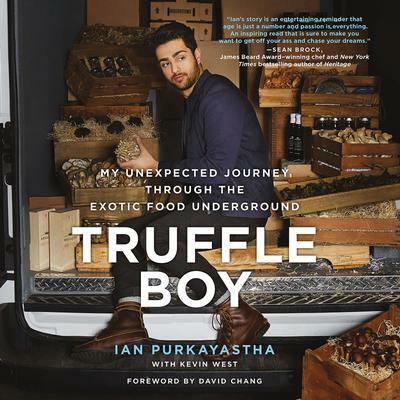 But before he was purveying the world's most expensive fungus to the country's most esteemed chefs, Ian was just a food-obsessed teenager in rural Arkansas--a misfit with a peculiar fascination for rare and exotic ingredients. The son of an Indian immigrant father and a Texan mother, Ian learned to forage for wild mushrooms from an uncle in the Ozark hills. Thus began a single-track fixation that led him to learn about the prized but elusive truffle, the king of all fungi. His first taste of truffle at age 15 sparked his improbable yet remarkable adventure through the strange--and often corrupt--business of the exotic food trade. Rife with tales from the hidden underbelly of the elite restaurant scene, Truffle Boy chronicles Ian's high stakes dealings with a truffle kingpin in Serbia, meth-head foragers in Oregon, crooked businessmen and maniacal chefs in Manhattan, gypsy truffle hunters in the forests of Hungary, and a supreme adventure to find "Gucci mushrooms" in the Himalayan foothills--the land of the gods. He endures harsh failures along the way but rebuilds with tremendous success by selling not just truffles but also caviar, wild mushrooms, rare foraged edibles, Wagyu beef, and other nearly unobtainable ingredients demanded by his Michelin-starred clients. Truffle Boy is a thrilling coming-of-age story and the incredible but true tale of a country kid who grows up to become a force in the world of fine dining.